The Labor Day weekend threw me for a loop as far as trying to get things done. This article was supposed to be published in the Havre Daily News on September 9, 2016, but I missed the deadline. So, here is a bonus article-enjoy! “R. X. Lewis, editor of the Havre Daily Promoter and one of the best known newspaper men of the state succumbed to the inevitable on Sunday morning last at Sacred Heart Hospital. Mr. Lewis was stricken about two weeks since with acute appendicitis, which necessitated an operation. Resultant complications taxed the strength of the patient to the extent that he had to mark “thirty” at an early hour Sunday morning. “Mr. Lewis has been engaged in newspaper work in Montana for 25 years or more, and was known as one of the brilliant pen wielders of the reassure state. He founded The Plaindealer in 1900, and piloted the destinies of this paper until July 1913, when he retired to devote his attention to farming on his homestead two miles south of Havre. After establishing that business Mr. Lewis returned to the field for which he was so eminently qualified, and assumed the editorship of the Havre Daily Promoter when that paper was established. He continued in that capacity until his death, which left a widow and two children, a boy and girl, to mourn a devoted husband and father. “Many business houses were closed on Thursday afternoon during the hours of the funeral of Darwin H. Campbell, one of the best known and respected business men of Havre, who died suddenly at his home on south Third avenue last Tuesday night. The funeral was conducted from the home of the deceased, and the house and grounds were filled with sorrowing friends. The funeral was conducted by the Havre lodge of Masons, of which Mr. Campbell was a member. The Elks also attended, as did the auxiliary order of Masons, the Eastern Stars. Darwin Campbell was the secretary/treasurer for the Havre Steam Laundry. 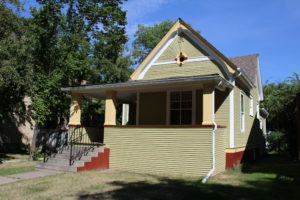 The Campbell home was at 614 Third Avenue. Both the Fenton and Polk Directories list the Rathbone residence at 509 Second Avenue, rather than Second Street. The home still stands today and has recently received a new coat of paint. It is the house pictured below. I did a little more research on the Campbell death, and it seems that he was shot, but by who, no one knew back then or knows now. Some speculate suicide, as a pistol was found near the body and it was known Mr. Campbell had a firearm for protection in his vehicle. All accounts show a happy home life, prosperous business and no money worries. Others believe that someone else, in an attempt to rob Mr. Campbell, grabbed the pistol, shot him and ran off before they could take his money. He had just sold his homestead, and was carrying a lot of cash. We will never know for sure, but a tragedy just the same.